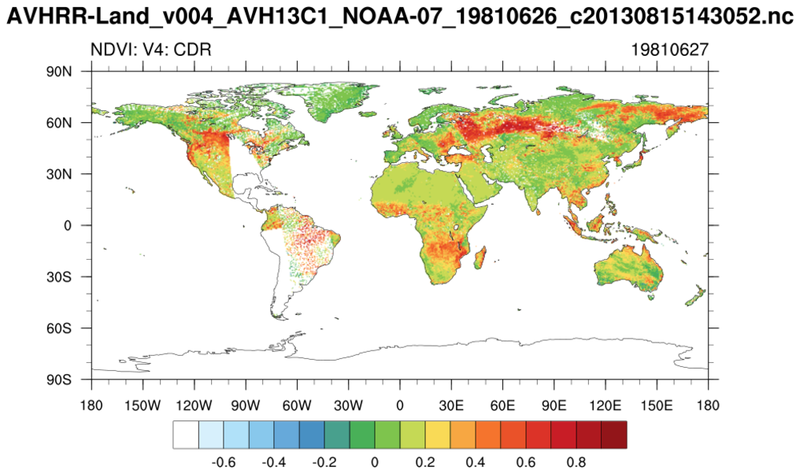 Values close to one (0.8-0.9) indicate the highest possible density of green leaves. 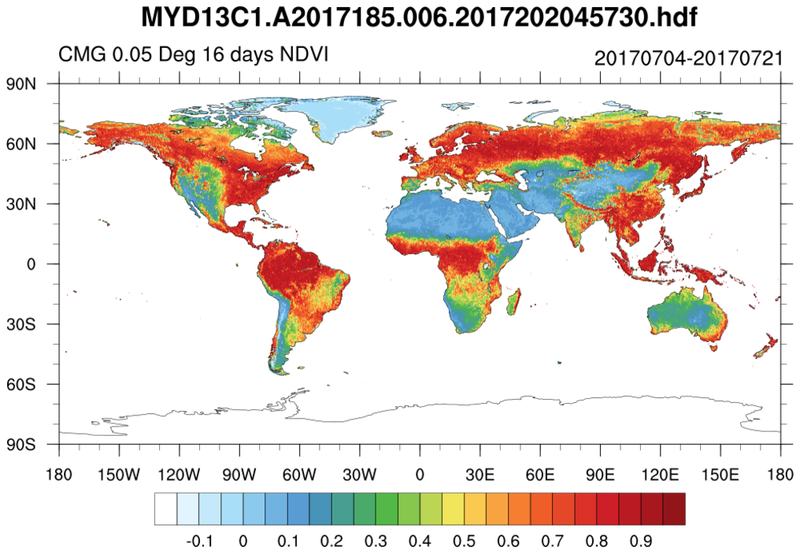 ndvi_1.ncl: Read the MODIS Normalized Difference Vegetation Index (NDVI) included in the MYD13C1 product. 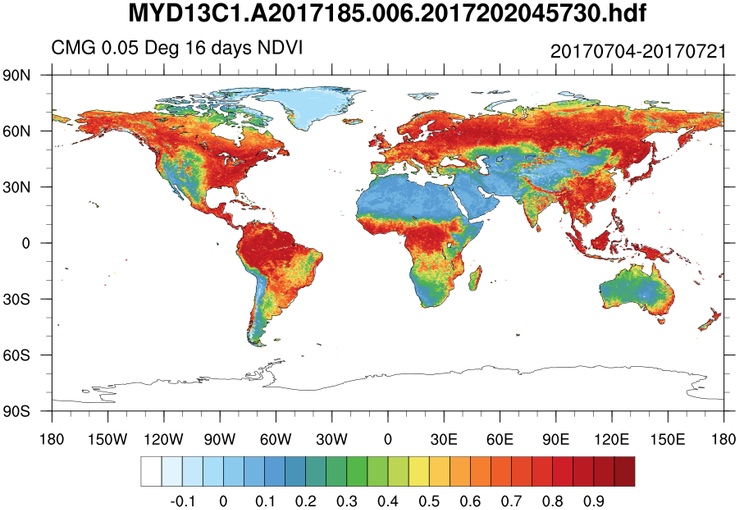 Global MODIS vegetation indices are designed to provide consistent spatial and temporal comparisons of vegetation conditions. 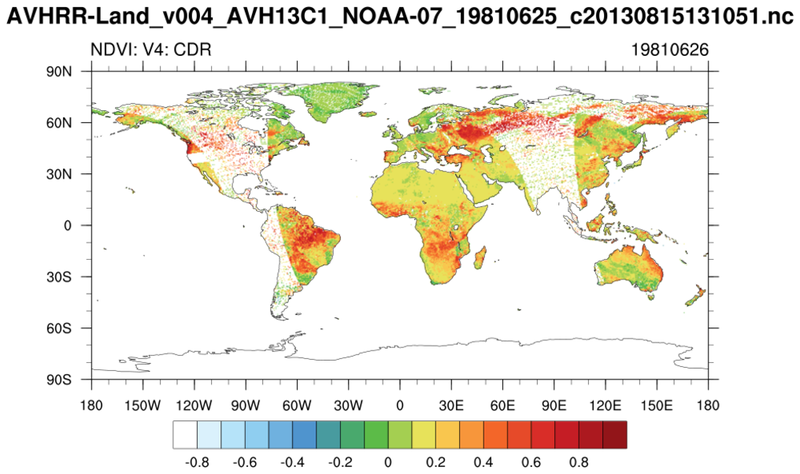 Blue, red, and near-infrared reflectances, centered at 470-nanometers, 648-nanometers, and 848-nanometers, respectively, are used to determine the MODIS daily vegetation indices. 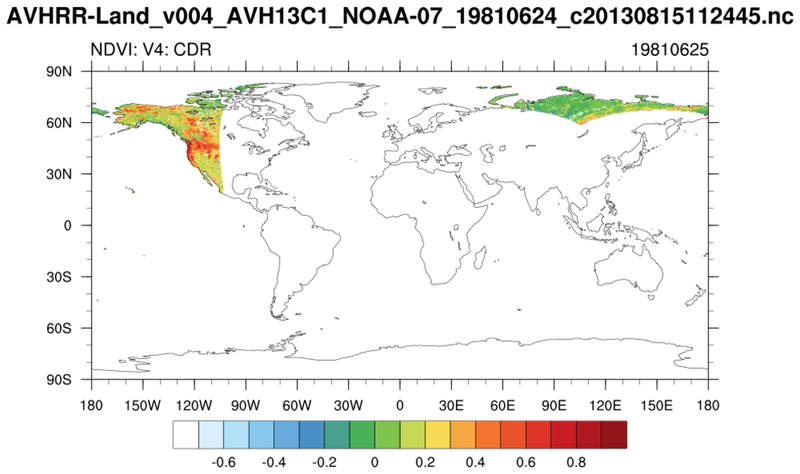 The MODIS Normalized Difference Vegetation Index (NDVI) complements NOAA's Advanced Very High Resolution Radiometer (AVHRR) NDVI products and provides continuity for historical applications. 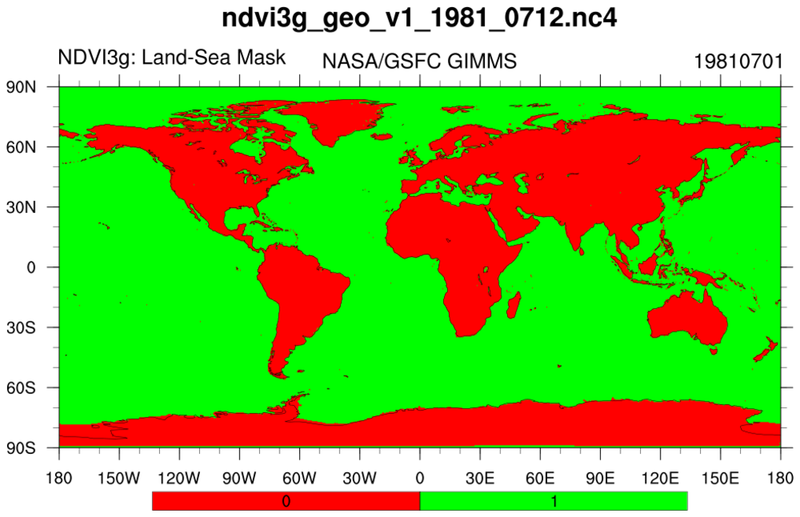 ndvi_2.ncl: Read a (not particularly well written) netCDF file containing the Normalized Difference Vegetation Index-3rd generation (NDVI3g) using the Global Inventory Monitoring and Modeling System (GIMMS). 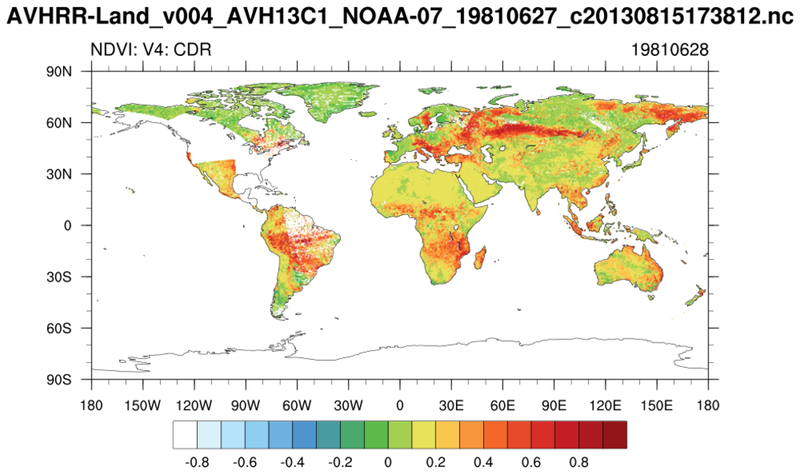 Vegetation indices are radiometric measures of photosynthetically active radiation absorbed by chlorophyll in the green leaves of vegetation canopies and are therefore good surrogate measures of the physiologically functioning surface greenness level of a region. 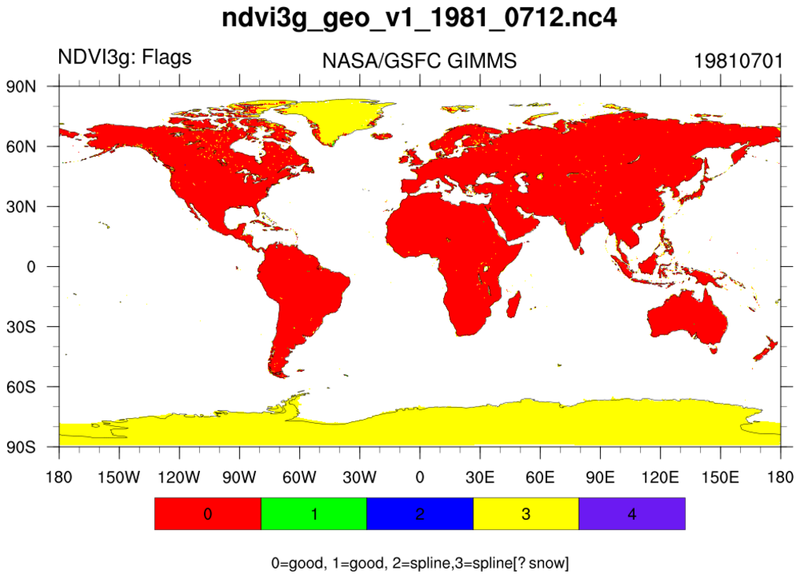 The NDVI3g are a consistent, long-term record of remotely sensed vegetation observations allows characterization the health of vegetation in different regions.